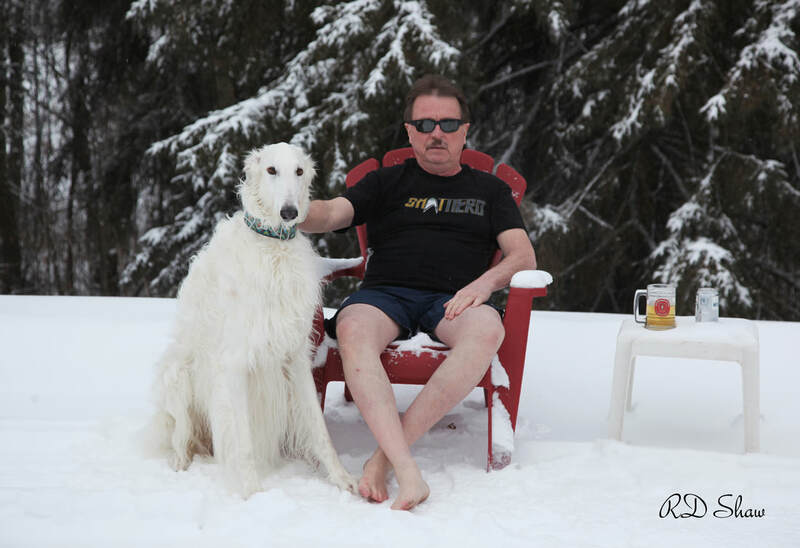 (Dave and Bob)--I have never understood these other dumb Canadians who run to Mexico or the Caribbean during the nicest time of the year (Saturday, Feb. 2, 2019, -23 degrees, 15 km NW wind with light snow, feels like -32 degrees). Davey as a puppy at Christmas. Lily is now a champion in the show ring, as she scored 5 points over the weekend at the Battle River Kennel Club Show. Both Bishop and River have been granted their Field Championships. Bishop and River went to The Foothills Gazehound event near Calgary on September 15 and 16. On day one, River received best of breed and Bishop got a second place. On day two, River was second place and Bishop was third. Bishop and River participated in the ALCA Show and Go on the long weekend. Bishop attained a BOB on day 1 and a 2nd on day 2 in the field, and a select dog in the conformation show on day 1. River received a 3rd and 4th in the field and BOS in the conformation show each day. The next ALCA run will be the Turkey Trot on the October Thanksgiving weekend. We are into August and we are pretty much done with the summer dog shows. Dave (Wolfwoods White Raven) received his Grand Championship certificate in early Spring, and Bishop received his Championship certificate. Dave was down in Richland, Washington for the American Borzoi National in May and placed second in the Open Class. He then attended and won the Canadian Borzoi National in Calgary, Alberta in early August. Dave, Lily, Sky, and Tegan have competed in local shows since the spring and have been successful in their classes. We are also coursing Bishop and River throughout the summer and fall, and they hope to retain number two and number four Canadian titles that they achieved in 2017. The ten month old, Wolfwoods Starfire (Winston) has come back to us from their owners and we are presently making arrangements for him. He reminds me quite a lot of his father, Dave. We will be attending a few fall shows before the winter arrives. And finally, a Dave/Lily breeding is planned for the Spring of 2019. Wolfwoods Starfire (Winston) at Ten Months Old is back at Wolfwoods.